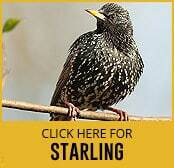 The starling (sturnus vulgaris) is one of the most frequently spotted birds around the UK. Smaller than a blackbird, the starling appears to be black in colour but is actually a glossy purple or green. Short tailed, with triangular wings and a pointed head they are well known for their noisy call. They can often be found in large numbers in populated areas and are one of the most common British birds. They can be extremely confident which leads them to become a household pest as they can choose to nest in large flocks in loft spaces and outbuildings causing a nuisance to homeowners. When the sturnus vulgaris chooses to nest in loft spaces they can cause structural damage. Their excrement is extremely unpleasant and is also hazardous to human health, spreading bacteria and disease. For these reasons, it is very important to call in a professional pest control service in order to resolve the problem.